More than a half-million new businesses open each year in the United States, according to the Small Business Administration. Unfortunately, more than 600,000 close. The Company Corporation, which can be found at incorporate.com, gives prospective business owners the best chance for success by helping them get off to the best start possible. Most new business owners have a lot of questions. The Company Corporation's website has an extensive educational section with articles covering every aspect of business ownership. 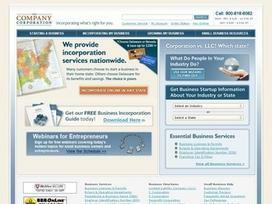 The site teaches what's involved in starting and operating a company. Information specific to each state is available, as is information for a wide range of industries. The Company Corporation allows prospective business owners to create a business entity online, with a minimum of hassle. Choices include the full range of business structures, including sole proprietorship, S corporation, C corporation, partnership, limited partnership, limited liability company and nonprofit corporation. Corporations and limited liability companies must appoint a registered agent to receive legal and tax documents. The Company Corporation acts as the registered agent. Because The Company Corporation can serve as a registered agent in any state in the country, it can help customers meet state laws requiring that business owners have such an agent in every state in which they transact business. Dealing with a tangle of red tape when a business opens is almost a given. Some of the most frustrating hassles relate to business licenses and permits. A mistake in applications, or even in determining what licenses and permits are needed, can subject customers to fines and shutdowns. The Company Corporation has a Business License Compliance Package wherein compliance experts evaluate customer needs and put together all the applications, plus instructions for completing them. The business name, or DBA, for "doing business as," is another factor that confuses new business owners. Before registering a business name, the business owner has to obtain the right to use it. The Company Corporation can research the company name to make sure it's available, and then reserve it. In many cases, The Company Corporation can register the name on a customer's behalf when the time comes. After a business is up and running, the client will need to keep up on any filings required by the state or federal government. The Company Corporation has a suite of services to help companies stay in compliance. The Company Corporation was founded in 1899. In the 100-plus years since, the company has helped hundreds of thousands of business owners incorporate or form LLCs. The Company Corporation is so confident of its ability to help its customers incorporate faster and less expensively than they would if they used an attorney that it offers a $50,000 Corporate Veil Guarantee against personal liability if the business owner uses the incorporation services of The Company Corporation and follows its guidelines for safeguarding personal assets. Share what you think about The Company Corporation, and your favorite ways to save there! I used this to incorporate my moving company business. Customer service was extremely helpful.